Imagine you’re in grade school, and despite having done nothing wrong or not having changed one bit, suddenly a group of people you thought were friends stopped involving you, inviting you and talking to you. Besides the obvious hurt, you’d probably need to look for a new set of friends. Like it or not, they don’t want any part of you, and you can’t force someone to do something. Dads have seen this kind of event play out before. It’s exactly what parent and baby magazines do to them all the time. 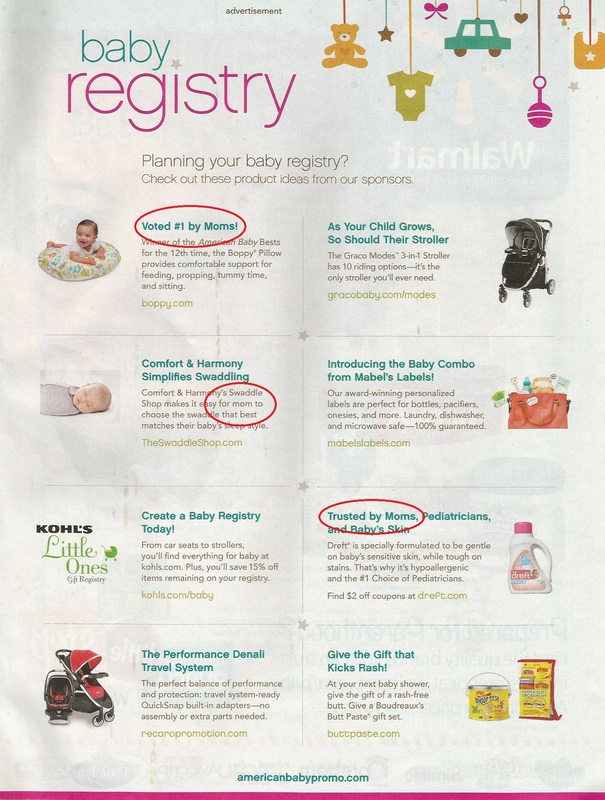 In the official Dads Don’t Exist publication, otherwise known as American Baby magazine, we found a full page advertisement titled “Baby Registry,” which showcases eight different advertisers. There you’ll find perennial dad snubbers Boppy and Dreft telling readers that dads don’t care for their kids, buy things for their kids, or shop. 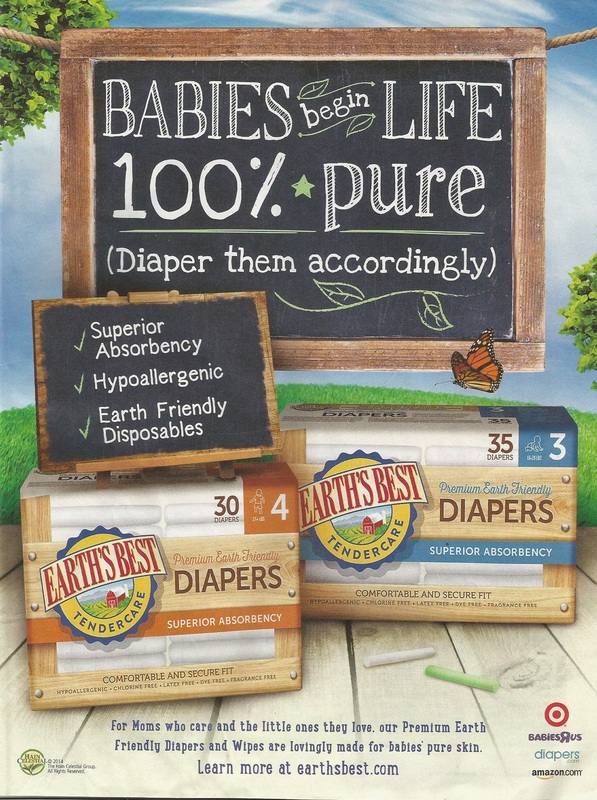 It’s no wonder we find skewed, short-sided propaganda like this, because dads are repetitively being told by marketers that they aren’t supposed to be caring for their kids. And we’re not trying to take sides, but look what kind of mess was created in New York City when its Mayor did. He started a firestorm, creating instant tension by speaking out against the very people in charge of maintaining safety and order. The city had senseless strain (and probably still does) all because one person turned his back on a group of people. 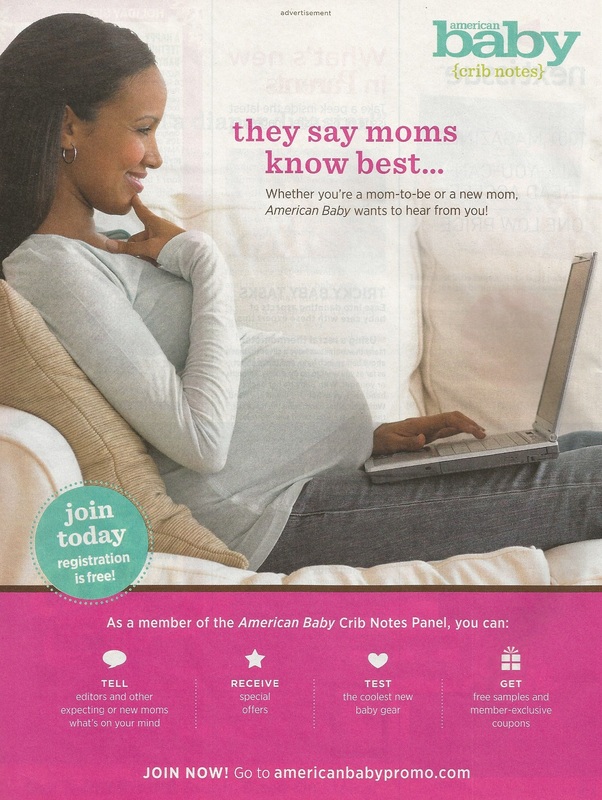 American Baby magazine takes sides in nearly every issue by turning its back on dads, telling them they’re not valid parents. In the case of dads, they can easily take their business elsewhere without saying a word. So imagine how much even more successful these businesses could be if they started involving, inviting and talking to dads. When companies receive customer inquiries, they have three basic communication options: 1. Ignore it, 2. Auto-respond, 3. Converse/engage. We’ve experienced all of these as consumers, and equally so here as dadmarketing employees. Ignoring the customer contact is the peculiar, and unfortunately all-too-often, approach. Many of us make contact with businesses quite frequently, sometimes without even realizing it, and it’s so often we never hear a thing. That’s troubling for those of us as customers, and potentially terminal for the company. Look at it this way: do you like being ignored by family, friends or co-workers? Auto-responses can certainly serve their purpose. Sometimes it’s nice to know the company received our email when we send it at 6 a.m. At the same time, the company isn’t fooling anyone; auto-responses feel distant, robotic and forced at times, leaving customers to feel like numbers. It makes the business feel like they’re all about busyness. Those companies who invest in people, however, and choose to converse and engage with its customers truly get it. Sure, it costs more to devote precious dollars to one-on-one interaction, but it’s totally worth it. Finding that level of interaction is rare, but it’s what separates the companies who care, from the ones who could care less. On Wednesday we received our regular email newsletter from Produce For Kids, a web resource created in 2002 by Shuman Produce, Inc., who grows and ships Vidalia sweet onions. Its website, produceforkids.com, is dedicated to educating families on the benefits of healthy eating, providing simple meal solutions and raising money for children’s non-profit organizations. 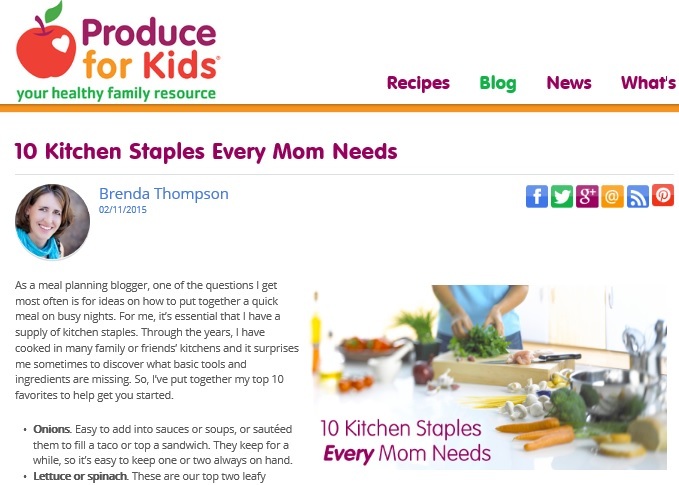 The email newsletter, however, carried a headline that troubled us: “10 Kitchen Staples Every Mom Needs.” We immediately wrote about it, and tweeted Produce For Kids about our post. They listened. They responded. We conversed. They made something wrong, right. In fact, they made the edit to the headline and photo graphic in a matter of minutes, something completely unheard of in a world of marketing that loves to exclude fathers from messages. Usually that kind of change, simple as it is, must swim through a lot of red tape and organizational bureaucracy. Cheerios is another story who turned around something negative into something positive, but that quest took several months. Produce For Kids turned righted the ship over the lunch hour. For an organization whose efforts revolve around food, produce, shopping, kitchens – it would be easy for it to fall into the dad-exclusionary trap and squarely ignore fathers like so many other businesses and organizations in the same arena. Instead, they have been one of the more stand-up groups, not using a slogan as mere lip service, but rather living by it. Check out its “About Us” page: it could have employed the stereotypical mom-child-kitchen photo, but it didn’t – they gave dads their due. 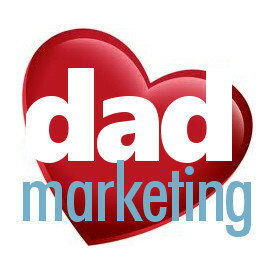 Here’s to Produce For Kids and its dedicated work at including everyone in the family in its mission — you have dadmarketing’s highest Seal of Approval. I thought we were past the whole “dads don’t cook” thing. Besides, this kind of old school caption is a tremendous disservice to moms, which still assumes mom’s place is in the kitchen. It also assumes that dad’s don’t help in the kitchen; for the majority of families 70 years ago, that might have been true, but not anymore. Women work outside the home now, and more and more, duties are shared. It’s not perfect in every home, but dads and moms are both taking on roles they never would have considered back in the day. Produce for Kids has an impressive reputation for using the word parent as much as possible, and not often excluding dads. Its blog author lineup is rather imbalanced by using only two dads, but at least the site has been fairly good about including fathers in photos, proving that they’re parents, too. Still ,we’d like to see them employ a more fatherly perspective from its writers, proving dad’s worth as a parent who cares about his kids’ nutrition. I’ve even seen dads in grocery stores. 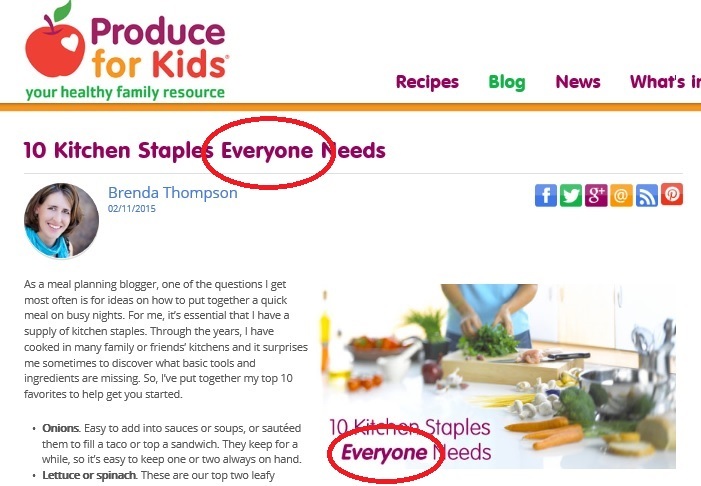 The least Produce for Kids could do is revise the headline – a simple fix – and thus make dads feel like PFK is talking to them, too. If this was a newspaper, it’s in print forever, and there’s no changing it. But the wonder of the Internet lets its authors/editors make changes whenever they want. Indeed, no one likes to be ignored, and dads are also looking for ideas on how to put together a quick meal on busy nights.